Review: I finished this book last month and I've been putting off the review because I have so many conflicting feelings about it. Almost of my goodreads friends gave this 5 stars and I thought I would love it too. I read Seabiscuit several years ago and though it was fantastic. Unfortunately, I was overall I was disappointed in this book. Let's dig in. The curious thing about Harris was that while he was certainly a tall man—six foot two or three, according to his daughter—virtually everyone, including Louie, would remember him as a giant, by one account six foot eight, by another six-ten. There is a claim of Louis running a 4:12 mile in SAND at one point and a lot of pages devoted to his time lost at sea involving sharks. Supposedly these pacific sharks had nothing to do all day besides circle Louis and his two comrades for weeks on end. And when one of the comrades dies and they put his body in the water, we are to believe that these starving sharks, who apparently had no other food supply, just left the body alone. Hmm, okay. And Louis, being starved, dehydrated and several burned after several weeks was able to punch sharks repeatedly to help repair the raft at one point. Hmm, okay. There is also a claim that he was moving 20-30 tons of material in a rail yard at one point. I've heard adrenaline can kick in at crazy times, so maybe that is what happened? The end of the book left me feeling like another chapter was missing. After becoming an alcoholic and experiencing PTSD, he's cured after listening to Billy Graham speak for a few hours. At least that is what I inferred from what was written. What?! I can believe that this was the catalyst to stop drinking, but how they cured him of PTSD, I don't understand. Okay, you may be thinking..this is not the most positive review so far. While I was disappointed in this book, there were some things I enjoyed. I thought Louis's older brother was fantastic, a wonderful person who helped Louis get on the right path and realize his potential (in terms of running). I love the focus on Japan, since every other WWII book I've read talks only about the German side of things. I learned a lot about the Japanese military (wow, scary stuff) and the Japanese POW camps. Overall, a dry, fact-filled book but I enjoyed the Japanese focus. The movie for this comes out in a few months and looks fantastic. I will definitely go see it. I think that while I found most of the characters one-dimensional on paper, they will really shine on screen. 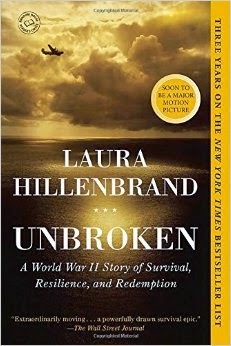 If you are a WWII buff, you will probably love this book.